It’s been a few years since the iPhone 4S launched, selling four million units on the first weekend itself making it the most successful launch ever. I was among the ones who woke up till 3am to pre-order mine when Apple opened the doors to pre-orders on Oct 7. Surprisingly, I ended up ordering through AT&T’s site after grappling with Apple’s Online Store for an hour without any luck. The next week was tough, waiting for it to ship and on the launch day the wait for the FedEx guy to deliver the iPhone was excruciating but in the end it was worth the wait. There were no activation issues for me and it has been smooth sailing since and my love for Siri has crossed appropriate bounds. A lot was said and written about the 4S when it was announced as people expected a lot more from this upgrade but an enhanced camera and goodness of Siri were more than enough to keep me interested in going for it. With one month completed, I can safely say that I haven’t been disappointed a single bit with my purchase. The appearance of the 4S might not be the talking point but there’s a lot has changed on the inside that makes 4S worth the upgrade. 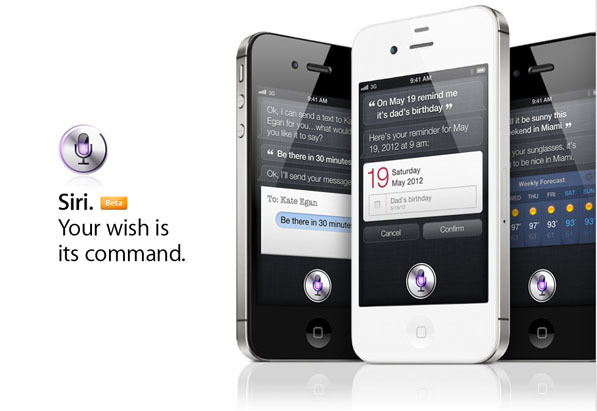 Right from out of the box PC free experience to the intelligence of Siri , iPhone 4S has a lot to offer. Let’s start with Siri, the most talked about feature on the 4S. Siri is a delight to use. I had my reservations about Siri recognizing an Indian accent but it does a decent job. There are times when I have to speak my query twice to make it understand, but most of the times I get it correct in the first go. The trick lies in speaking a tad bit slower than what we Indians normally do. I(and probably every iPhone 4S owner) spent the first few days thinking of clever things to ask Siri and then watch it turn up with funny answers only to post it on the web. Those few days playing with Siri were totally fun but we’re back to business now and she’s the best personal assistant you could’ve asked for. Siri does an excellent job at crunching complex queries to return meaningful results. So be it getting directions to a new restaurant in town or setting up reminders, Siri can handle it all with ease. The ability to pull data from WolframAlpha to answer queries is really cool. Dictation is another awesome feature and the list doesn’t end here. You’ll need to use it to experience the awesomeness that Siri is. Reliability though is an issue and network problems crop up every once in a while and that is probably the reason Apple decided to give the service a beta tag. iOS 5.1 is rumored to add more features to Siri such as toggling WiFi/Bluetooth switches, taking photos/videos and other neat stuff. Once you’ve gotten used to Siri, there’s no looking back as it has already become an indispensable part of your life. Addition of dual-core A5 processor to the iPhone is a big upgrade that hasn’t gotten enough attention. The power of the A5 is noticeable when you launch an app and it opens up in a flash. The camera app is the perfect example for A5′s horsepower whose performance has increased manifold in the 4S. It now takes less than a second to launch the camera and take a picture. Also, app switching is faster than ever before and the cold start time has plummeted to an all-time low. Safari has also gained significantly with the A5 upgrade making the browsing experience oh-so-much better. The super quick Safari launch coupled with fast rendering of web pages, makes it a delight to use. I cannot emphasize enough the fact that A5 is a huge upgrade for the iPhone and you realize that only after a hands-on experience with the 4S. The whole camera system on the iPhone has received a significant upgrade with the 4S. It’s not just the megapixel bump that is the big feature here but the new backlit sensor combined with the power of A5 has led to a revolutionary new camera. The backlit sensor has greatly improved the low-light capability of the camera. Super-quick snapshots meant that I was able to capturenon-blurry pictures even while walking at a normal pace. The pictures turned out great not just because of the new hardware in place but also due to a much better image processing algorithm that now works its magic on the images. There’s also face detection capability added for automatic exposure balance across up to 10 faces. New optics, megapixel bump, face detection, faster and improved image processing combined with the ability to edit photos built within the Photos app makes it the best smartphone camera out there and you couldn’t have asked for more. iOS 5 is the goodness that makes everything happen on the iPhone. It was demoed back in June at WWDC and became fit for public consumption on Oct 12. A lot has changed since iOS 4 and some of the more notable changes include a Notification Center, iMessage, Newsstand, Reminders app, iCloud, twitter integration and enhanced Photos, Mail and Calendar apps. Notification Center takes a leaf out of Android’s book with a strikingly similar implementation of a pull-down menu displaying aggregated notifications. It gets rids of the annoying popups that have haunted users for a long time to pave the way for a smoother iOS experience. iMessage is probably the best new feature of iOS 5 that lets you send messages to fellow iOS 5 users without having to incur carrier text costs. iMessage is beautifully integrated within the Messages app and as soon as you punch in a number/email ID, iOS 5 uses some kind of black magic to determine if the user is on iOS 5 and sends him/her an iMessage rather than a text over the cellular network. I’ve already gotten rid of AT&T’s $20 unlimited text plan, such is the power of iMessage. Reminders is Apple’s home-brewed To-Do app that is integrated with Siri. It has a rather simple interface that does the job but I feel it lacks the finesse that one generally expects from Apple apps. Twitter integration to iOS is a neat addition and it compose tweets directly from Safari, Photos, Camera, YouTube, or Maps. Avid newspaper and magazine readers will love the Newsstand app, a hub for organizing all your subscriptions in one place. There are however, a few things where the 4S could have improved upon. Battery life, iOS 5 issues aside, hasn’t improved over the previous iPhone. The usage time remains the same but the standby time has been cut down to two-thirds which is clearly evident in daily use. I haven’t been able to make the battery last couple of days on normal use which I managed to do on a regular basis with the iPhone 4. There have been rumors that iOS 5.0.2 might fix this, so let’s wait for the update before making a final judgement on it. Talking about the form factor, I totally loved the iPhone 4 redesign and wasn’t disappointed to see 4S arrive in the same avatar though I was secretly hoping it would shed a few grams. On the contrary, it gained an extra three grams leaving me a little heartbroken. Other than these small quirks, iPhone 4S is a neat upgrade over the iPhone 4. iPhone 3GS/3G users looking to upgrade should do it in a jiffy. iPhone 4 users might not be interested in having an improved camera or a faster processor but Siri is surely a good enough reason to take the plunge. I’d say do it.